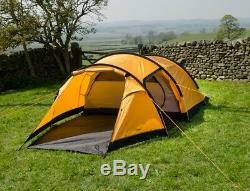 Snugpak Journey Quad Tent 4 Man Camping Shelter, 4 Person Sunburst. Fast pitching, 4-man tunnel tent with extended living area for group backpacking and camping. With over 40 years of experience, UK outdoor experts Snugpak offer a high-quality range of tried and tested tents for use in all conditions. The Journey Quad tent gives you the largest, most spacious in the Snugpak Journey range. A versatile family/group camping shelter built around a tunnel style design, the Journey offers a comfortable living space with a low profile that holds up to windy conditions. The Journey Quad features a durable construction with room enough for 4 occupants and kit with an extended front porch for added gear storage, meal prep and waiting out poor weather. The practical design features stormproof protection with 4000mm waterproofing in the flysheet and 5000mm in the bathtub style floor. The included tent footprint delivers added protection from rough and/or damp ground. The flysheet pitches first to serve as the primary structure, with the inner attaching from inside to the fly. Two scooped mesh vents in the flysheet direct airflow and reduce condensation. A fun and quick to pitch 4 man tent with Snugpak's dependable design for all outdoor adventures from car touring and wild camping to group trekking and hiking. A perfect DofE group tent with the pack-weight divided between the party. Spacious & robust 4 man tunnel camping tent. Generous front vestibule for added living space. Supplied with 18 lightweight Y pegs. Included Footprint protects the floor & keeps the base of your tent clean. Supplied with a repair kit. Poles: 3 lightweight alloy poles with press fit connections. Rainfly: 75D, 185T Polyester PU 4000 mm F/R. Inner: 190T Nylon with Polyester W/R F/R. Floor Fabric: 210T Polyester PU 5000 mm F/R. We are Absolute-Snow , the UK's leading independent retailer of extreme sports equipment and associated fashion clothing. We have a shop in Hemel Hempstead, Hertfordshire and visitors are most welcome. We have been in business since 2004 and are proud of our customer service record. Do a Google search for "Absolute-Snow" to find out more. Same Day Despatch Pay before 1.00pm Monday to Friday for same day despatch. We do not hang about and neither does your parcel! Most (but not all) items can be collected from our shop in Watford. Some products are held in stock at our suppliers. Our address, road directions and opening hours can be seen on our Absolute-Snow website. We are an established UK retailer, with a bricks and mortar shop and have been trading online since 2004. Please do not return parcels without contacting us first because we have several warehouses and we need to tell you where your items should be sent. We believe our prices are the lowest on the internet. We price check all our competitors every week. We will price match if you find a better offer elsewhere. Please send us a link to where you have found it cheaper. Visitors to our shop, please refer to our Absolute-Snow website for our address, maps, road direction and our opening hours. The item "Snugpak Journey Quad Tent 4 Man Camping Shelter, 4 Person Sunburst" is in sale since Monday, April 8, 2019. This item is in the category "Sporting Goods\Camping & Hiking\Tents & Canopies\Other Tents & Canopies". The seller is "absolute-snow" and is located in Hemel Hempstead, HP3 9HD, UK. This item can be shipped to United Kingdom, United States, Australia, Germany, France, Italy, Spain.